The Knights and Bikes series is based on the characters and setting of the video game of the same name by Foam Sword Games. 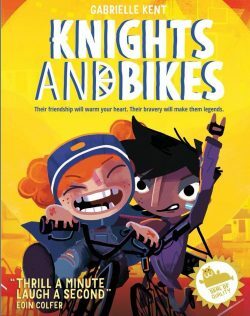 Set on a Cornish island in the 1980’s, Knights and Bikes follows the story of new best friends Demelza and Nessa as they explore the island and uncover clues on their trusty two wheeled steeds as they hunt for the cursed treasure of the Penfurzy Knights. You can read a sample here! Longlisted for the Blue Peter Awards 2019.